ID diagnostic strips | MIKROLATEST® ID | Erba Lachema s.r.o. MIKROLATEST® detection strips are plastic strips with a porous zone made from filter paper containing reagent substrate for detection of bacterial enzyme or metabolite. Strips are a modern, user-friendly and economical alternative to diagnostic discs. According to their types, the bacterial culture tested is either rubbed into the reagent zone or the strip is inserted into a tube containing an examined bacterial suspension and cultured. The detection strips are used either together with MIKROLATEST® identification kits for the additional testing or separately. In some cases, additional reagents should be used in order to improve reaction sensitivity. One strip package is sufficient for 50 examinations. Detection strips should be stored in a refrigerator at the temperature of +2 up to +8 °C. OXItest detection strip is designed for bacterial cytochromoxidase detection. Its presence is detected by a colour reaction of N,N-dimethyl-1,4-phenylenediamine with α-naphthol accompanied by formation of indophenol blue. Iron, contained in a cytochrome molecule, is responsible for cytochrome oxidation/reduction process. To avoid the interference due to iron ions, it’s necessary to use plastic or platinum loop when carrying out this test. Reaction sensitivity can be increased by the relevant OXItest reagent: Prior to strain application, the strip zone is wetted with the reagent without oversaturation. The test is carried out by spreading a pure bacterial culture on the impregnated strip zone or by pressing the strip directly on a bacterial colony on culture medium. Test result is read within 1 minute. Hydrolysis is detected by Reagent for PYR test and demonstrated in red coloration. The test can also be used individually as a differential test for the Enterobacteriaceae family strains and Staphylococcus genus, or as a supplementary test to identification kits MIKROLATEST®. PYRAtest allows to perform 50 determinations. 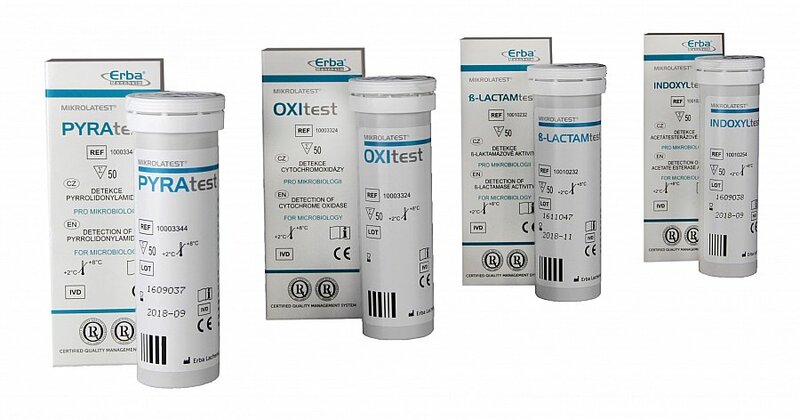 ß-LACTAMtest is designed for rapid acidometric detection of bacterial ß-lactamase activity.This acidometric method is recommended for testing ß-lactamase production by Neisseria species, Haemophilus species and Staphylococcus species. Lactamase enzyme hydrolyses benzylpenicillin contained in the reaction zone, and causes colour change of pH indicator in the detection zone due to pH shift. INDOXYLtest detection strip is designed for rapid acetate-esterase detection of M. catarrhalis, Campylobacter sp., etc. The test is based on a principle of hydrolysis of the active substrate, i.e. 3-indoxyl-acetate, to the leuco form of indigo. Blue colour of the diagnostic zone is regarded as a positive proof of acetate-esterase activity of the respective microorganism. ONPtest is designed for the ß-galactosidase detection. ß-galactosidase is an intracellular enzyme catalyzing the cleavage of lactose. Lactose fermentation into monosaccharides galactose and glucose is dependent on another enzyme – permease, which is necessary for the penetration of lactose into the bacterial cell. In the absence of permease, a ß-galactosidase-positive organism will not ferment lactose. In such cases it is advantageous to use ONPtest. Enzyme ß-galactosidase hydrolyses the colourless substrate of O-nitrophenyl-ß-galactopyranoside; the positive reaction is detected by yellow colouring of free O-nitrophenol. The strip is dipped into a defined bacterial suspension and incubated. Reaction can be evaluated within 4, 24 or 48 hours according to the strain type. Detection strip HIPPURATEtest is designed for the determination of bacteria ability to hydrolyse Natrium hippurate. Enzyme Hippurate hydrolase splits Natrium hippurate into glycine and benzoic acid. Glycine liberated by Natrium hippurate hydrolysis is detected by the colour reaction with ninhydrin contained in the Reagent for HIPPURATE test. The strip is dipped into the strain suspension and incubated for 22-24 hours. Reagent for HIPPURATEtest is added, reaction is evaluated after additional 5-10 minutes. HIPPURATEtest is recommended for the presumptive identification of Group B streptococci, Gardnerella vaginalis and Campylobacter jejuni. COLItest is a highly specific test for rapid identification of Escherichia coli using detection of ß-glucuronidase activity and indole formation. Enzyme ß-glucuronidase cleaves 4-methyl-umbellipheryl-ß-D-glucuronide (MUG), the 4-umbellipheron is formed and it shows blue fluorescence under UV light source. Indole formation from L-tryptophan is detected by red colouring after adding the Reagent for INDOLE test. Combination of positive ß-glucuronidase and indol reactions shows approx. 95% specificity for Escherichia coli. COLItest can also be successfully used for the presumptive identification of enterohaemorrhagic Escherichia coli O 157 H:7 with typical combination of negative ß-glucuronidase and positive indol reactions. ß-glucuronidase test can also be used for the differentiation in other bacterial groups, e.g. staphylococci. The strip is dipped into a defined strain suspension and incubated for 4 hours. The preliminary reading of ß-glucuronidase reaction under UV-lamp is possible within 1 hour; after 4 hours of incubation, the Reagent for INDOLE test is added and indole reaction is visually evaluated. VPtest is designed for the rapid detection of acetoin formation (Voges-Proskauer test). Natrium pyruvate is used as the substrate for acetoin formation. The strip is dipped into a defined strain suspension and incubated for 2 – 4 hours. After incubation, reagents VPT I and VPT II are added and incubation is continued for 30 more minutes. Red colour indicates acetoin formation.